The Article: U.S. media complicit in Obama’s drone doctrine by Neil MacDonald in CBC News. Most of us, including many of my American colleagues, preferred the term “extrajudicial assassination.” We felt we were in the news business, not the euphemism business. Yet another government document has been leaked, this time a so-called “white paper” in which the U.S. Department of Justice lays out the administration’s justification for killing American citizens it suspects of belonging to Al-Qaeda. U.S. media outlets, it seems, are perfectly comfortable with the term “targeted killing,” now that it is a major tool for the Pentagon and CIA. It’s also clear American media outlets are comfortable suppressing news the government does not want published. Today’s story reveals not just that the Americans have operated a secret drone base for years in Saudi Arabia, but that the Post, along with various other news organizations, have been keeping that fact to themselves at the government’s request. It isn’t the first time such information has been suppressed. In 2005, bowing to the White House, the New York Times for months kept confidential the fact that the Bush administration had been carrying out warrantless wiretapping. The revelations eventually provoked Congress to pass a new law. 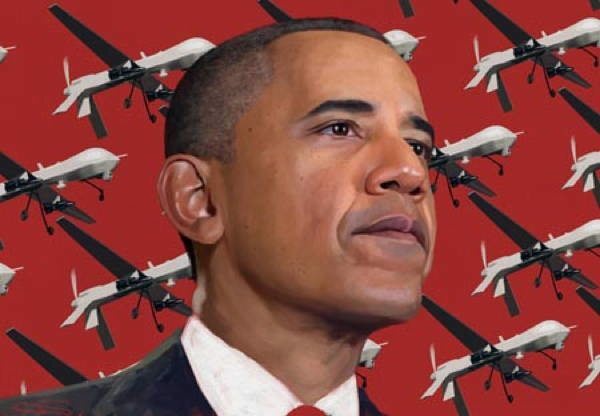 Reports on the U.S. drone program, also based on leaks, have described how Barack Obama’s administration has become ever more dependent on remote-controlled killing. Obama himself reportedly signs off personally on each target. The term “senior operational leader” appears to be key. An American citizen who is a low-level fighter would appear to enjoy a legal immunity that does not extend to foreign nationals suspected of planning or involvement in attacks on Americans. There is an accompanying article today on the astonishing fact that 54 countries, including Canada, have participated in or enabled the CIA’s “extraordinary rendition” program of sending suspected militants to be interrogated, sometimes under torture, in secret prisons and by totalitarian regimes worldwide. Twelve years ago, reporters had a different term for that sort of thing, too: kidnapping. All these hardened security measures were begun under the Bush administration. President Obama, who once denounced them and even, as president, ordered Bush legal memos be made public, has not just amplified Bush’s programs, but has begun vigorously hunting down and prosecuting officials who leak details. And that is one initiative the American media is not so comfortable with. Some are calling it Obama’s “war on whistleblowers.” Current Attorney-General Eric Holder has prosecuted more officials for leaking information to reporters than any of his predecessors since the Second World War. The government has hunted down intelligence officials who leaked details of expensive programs to spy on internet traffic, wiretaps placed in the Israeli embassy in Washington and of Obama’s personal involvement in selecting drone targets. Several news outlets have noted, rather acidly, that the administration seems fairly expert at leaking classified material that makes the government look good. None of this makes Obama different from any previous president. It just demonstrates his ability to keep the nation’s media on board, and mete out punishment when they publish the wrong sorts of secrets.